Donations close at midnight tonight. 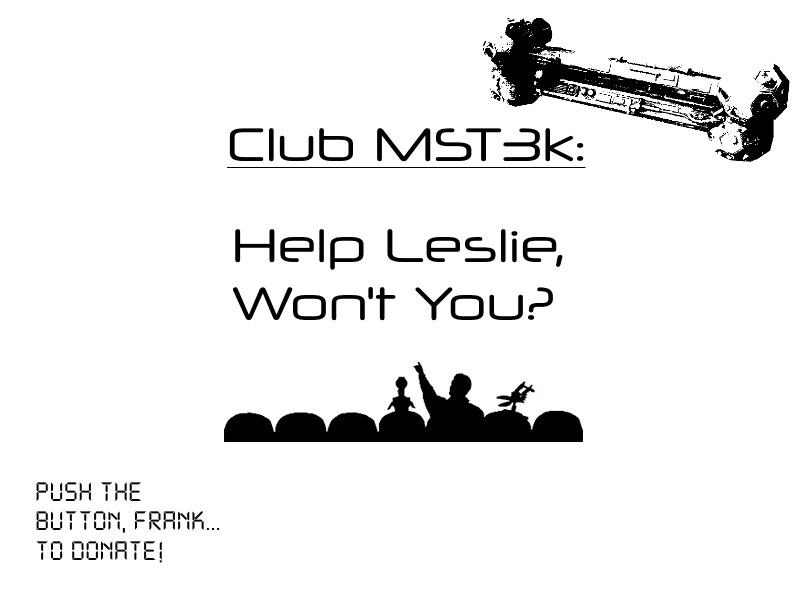 Once again, thank you Club MST3K! :D WIth your help, Leslie will hopefully find an apartment that is Killer Shrew-proof and insured against Giant Spider Invasion attacks! Holy sh*t, I met Trace. New Rifftrax full-length features are available for free on Hulu! They include Buffalo Rider, Mesa of Lost Women, Ghosthouse and Frankenstein Island! Yeah, I know Hulu is kinda lame but you can watch all these for free without coughing up a subscription fee like with Netflix. Let the viewing commence! 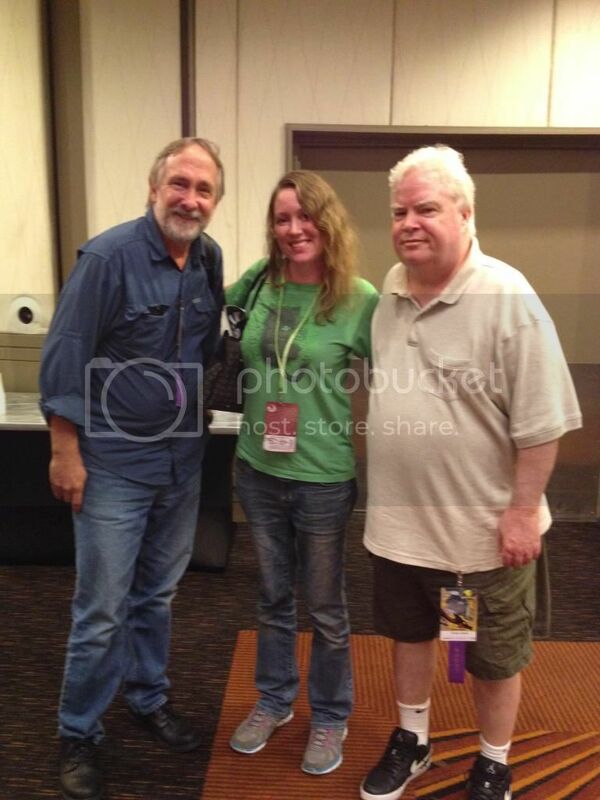 For anyone who hasn't heard, the Rifftrax crew is re-broadcasting the riffing of Godzilla tonight! It won't be on VOD so this is the last chance to see the event. I missed it last week so I'm super stoked about going to see it tonight. Let's keep on helping our fellow MSTie Leslie, you guys! Attention! Operation Help Leslie has commenced! Howdy, fellow MSTies! For those of you who don't know, our friend and fellow MSTie Club member Leslie is facing some tough circumstances. As she posted in the forum, she is working hard to find a job so she can a get a place to stay. We all know that it's tough to find a job right now. Leslie has been with us since the beginning of the Club and we all enjoy her presence here. The goal is just an arbitrary number, any amount you can give would be amazing! But, hey, if we hit that goal, that would be more awesome than a plate of Space Spuds! Dig deep and help out a friend! The page is set up in my name for legal reasons but all donations go straight to Leslie, I've already cleared it with her. So let's do this! Power up the lasers, activate the thrusters, pop the popcorn! WE'VE GOT DONATION SIIIIIGGGNNNNN!!!! I won't be able to make it to RT Live: Godzilla because of lame work stuff. Will someone who is watching it beam it to me psychically with MindVision? It would be much appreciated. Thank you and have a pleasant tomrorrow. Vatican II: The Final Reckoning. Well, I'm ready for my own Manhattan project, if ya know what I mean. I think this is what you'd get if Darren Aronofsky had directed "Flashdance". He's sneaking past Robert Fripp's room. Ah, that was a très bien merde.